Game of Thrones: Conquest and revealed the first teaser trailer. Developed by Turbine, the MMO strategy mobile game is coming to the App Store and Google Play on 19th October 2017. 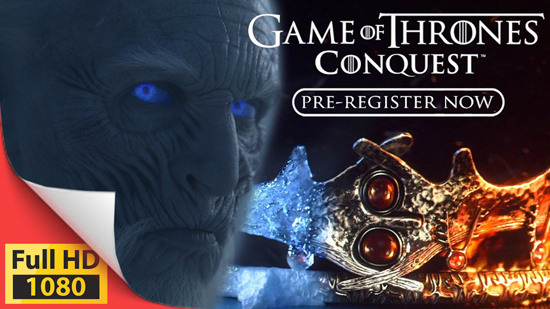 Whether it’s through sheer might or deception, Game of Thrones: Conquest lets players rule their House as they choose. Powerful armies will be raised to march against rivals, while players command their own small councils to sabotage their enemies from within. But only the most cunning have what it takes to sit atop the Iron Throne. Developed by Turbine, the MMO strategy mobile game is coming to the App Store and Google Play later this month. Players who pre-register for Game of Thrones: Conquest at the official site will receive the Prepare for War Bundle the first week of launch only, which will include exclusive Night’s Watch training gear, as well as gold and resources to aid in their fight for the Iron Throne.